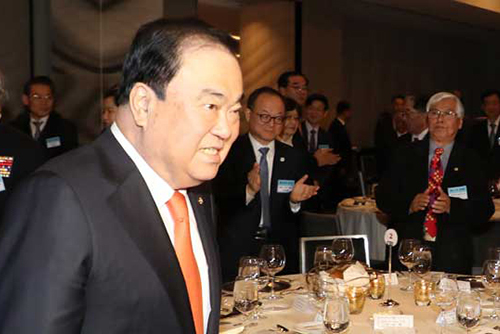 National Assembly Speaker Moon Hee-sang has defended his remarks about the Japanese emperor's responsibility over his country's wartime sexual slavery. In a meeting with reporters near Washington D.C. on Tuesday, Speaker Moon refuted Japanese politicians’ demand that he apologize for seeking an apology from Emperor Akihito. Moon said he has called for such an apology over the past ten years and still believes it is a fundamental solution to the sexual slavery issue. The gist of his remarks, he said, is that Japan can swiftly resolve the matter by issuing a sincere apology that can draw forgiveness from the victims. In an interview with Bloomberg last Friday, Speaker Moon said Akihito should deliver the apology before he abdicates in April, adding he is the son of the main culprit of Japan's war crimes.